The German Shepherd is a breed of large-sized working dog that originated in Germany, and sometimes it is abbreviated as "GSD". German Shepherds were developed originally for herding sheep. Because of their strength, intelligence, trainability and obedience, German Shepherds are the preferred breed for many types of work, including search-and-rescue, police and military roles and even acting. Today the German Shepherd is the second-most popular breed of dog in the United States. In the past years, several famous dogs of German Shepherd breed have made names for themselves. There are countless famous German Shepherds in the history. Some of them are hero dogs, and some of them are great pet dogs. They all will be in our heart for ever. If you are looking for a name for German Shepherd breed, it is a great idea to consider famous GSD names. We picked five famous dog name among them, and they are believed the flags of famous German Shepherd dogs. Roy Rogers and Dale Evans owned this family German Shepherd dog. Bullet was always getting Roy out of sticky situations. Bullet also starred as himself in the "Roy Rogers Show." Champ was a dog of Vice President Joe Biden. The VP like German Shepherd dogs and in the past he has been owned by several German Shepherds. Clipper was a dog of President John Kennedy, and the German Shepherd dog was a strong protector of Jackie. Major was a famous German Shepherd dog of Franklin D. Roosevelt. The dog once ripped the pants off of Ramsay MacDonald, the British Prime Minister. Then Britain was preparing to go to war with Germany. 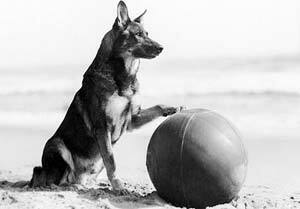 Rin Tin Tin is one of the most famous dogs and recognized names in German Shepherd Dog history. The Rinty line is the oldest continuous bloodline in the history of the breed.